Well all-right! With a month break in major holidays, we rallied our team to get you a new Starring You dance to create and share! Launching today, our Russian Dance will be free for the first 48 hours (Promotion over, thanks for playing folks!) as part of a celebration in reaching 300,000 Facebook fans this week. 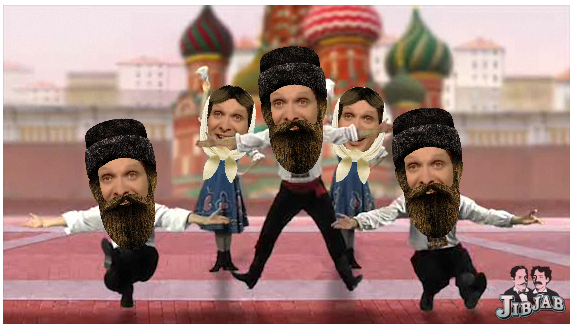 Click here to make a wacky five person Russian Dance right now, comrade! By the way, that’s the Trolololo guy, if you didn’t notice. This entry was written by paulhanges and posted on March 22, 2011 at 3:43 pm and filed under New Content. Bookmark the permalink. Follow any comments here with the RSS feed for this post. Trackbacks are closed, but you can post a comment. I love your guy’s site. I wish you would do more projects for women & kid’s.